According to a new market report published by Transparency Market Research titled “Domestic Booster Pump Market – Global Industry Analysis, Size, Share, Growth, Trends, and Forecast, 2018 – 2026,”the global domestic booster pump market is expected to reach US$ 4.69 Bn by 2026, expanding at a CAGR of 8.3% from 2018 to 2026. Asia Pacific held the dominant market share of the domestic booster pump market in 2017. A booster pump is a single or multi-stage pump with start/stop functionalities such as a pressure switch or small control unit to start/stop the pump. The allocation of huge funds by the governments of countries such as India toward various industrialization and urbanization projects is anticipated to create huge opportunities for the pumps and booster pumps market in the near future. The number of small- and medium-sized players in the pumps market is rising rapidly. As compared to organized pump manufacturers, small and medium companies offer products at low-cost. The global consumption of pumps is very high due to continuous growth in population and residential construction. Technological advancement in product manufacturing to create a diverse product portfolio acts as a strength to the domestic booster pumps market. Asia Pacific is expected to have the highest growth rate during the forecast period due to continuous growth in population and residential construction in this region. The market share of domestic booster pumps in Asia Pacific was 37.2% in 2017 followed by Europe. The mass migration of rural citizens into major urban centers along with the continued development of rural areas is expected to generate high demand for booster pumps in water infrastructure, power generation, and to meet other basic needs of the growing population. By product, multiple stage pumps have the highest growth opportunities as consumers prefer to choose multiple stage domestic booster pumps over single stage pumps as these types of pumps are used to boost water supply in tall buildings or in hilly areas for various commercial and residential applications. By application, residential homes/flats segment in the domestic booster pumps market holds the largest share and is expected to continue its dominant market position in the near future as there are more residential homes/flats as compared to farm houses and guest houses. By distribution channel, demand for booster pumps across DIY distribution channel segment is expected to witness shift, as end users are exploring products which are easy to install and consume less time for operation of the pump. Demand for booster pumps in wholesalers segment has gone up in recent years due to rapid urbanization and in order to meet the needs of a growing population. Omni-channel strategy is expected to have a compounding impact on the growth of wholesalers. It has helped wholesalers to enlarge their customer base. Since it unifies all the channels, it effectively promotes the idea of one brand, one experience to the consumer across all touch points. Companies are focusing on achieving long-term growth through innovations in the domestic booster pumps market. 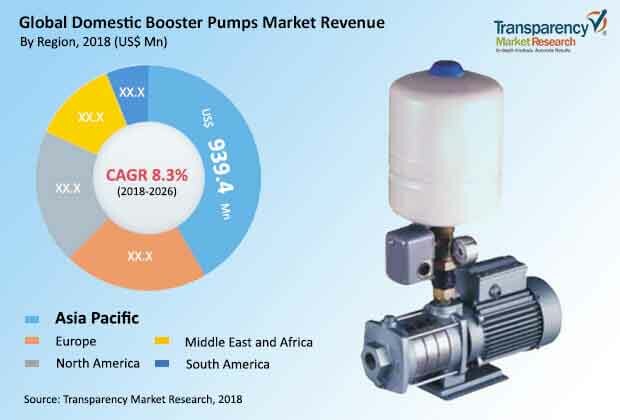 Some of the major competitors in the global domestic booster pump market include Aquatec International, Inc., Dab Pumps Spa, KSB Pumps Limited, Franklin Electric Co., Inc., Grundfos, Xylem Inc., Kärcher International, SyncroFlo Inc., Wilo SE, and Zodiac Pool Solutions.